Only Parent Chronicles: Bloggy Love! While I'm sure some of you were expecting part 4 of my long, drawn out personal saga, you won't find that here today. While I am perfectly resolved to continue to share, I am a bit worn out from the emotional process involved thus far. As I am sure you are aware, details have been abbreviated for the sake of space and to eliminate droning on with a sob story, but I have still been reliving those moments as I write. So I am taking a break from the story, but promise to finish it soon. 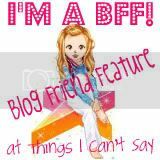 Today, I want to give some shout outs and bloggy love to some of my favorite peeps in the blogosphere. Like me, I am sure you have your core group of peeps you read daily. I'm going to spend some time this month loving up as many of my favorites as possible. One of the first blogs I started following when I began my blog was Diary of a Mad Bathroom, authored by DG. This woman cracks me sideways with her with and humor. I love that she completely and totally accepts life as it comes and can always find humor in what the world throws at her. The slogan on her blog really says it all, "We're not the Osbournes, but we're not Ozzie and Harriet either." If you've never read her, get over there and check her out. I belly laugh every time. 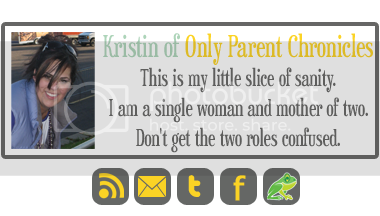 Another of my favorites is Single Mom Mindy over at Single Mom Says. Sometimes comic, sometimes serious, Mindy speaks to a ginormous group of women when she addresses her daily thoughts. I had asked Mindy to do a guest post at the end of this month, but this super smart, super funny, super busy lady had to sadly decline. Because I love her blog so much, I still would love for you to go check her out! I'm sure you'll dig her as much as I do. Holy Hannah, at Be the Butterfly is a new blogger. I have know this woman IRL for almost 10 years. She makes me laugh, she makes me cry, and now you can see why I love this lady. Newly divorced, again, she writes about her struggles with identity and raising two hard to handle boys! Check all of these ladies out! Give them a little bloggy love, and follow along if you think you can't get enough. I know I can't! Off to check out them out right now! Aw, thank you so much for the very lovely mention! And sorry about the guest post. :( This is going to be quite a month for me. (oh hell, arent't they all?) But this one is kinda d-day time. Anyhooo- looks like I have another blog to check out as well as catch up on some of your posts! I love good blogs. Thanks! Ohhh, a couple that I don't read already!! I have been trying to comment on your other posts, and for some reason I haven't been able to. I just wanted to tell you how much I respect you and that you have let us all in like this. Ditto to Daffy---as if I need more blogs to follow---but I am heading over now! I'm already a fan of Mindy's; will have to check out the others.